This adjustable knife sharpener is manufactured by Smiths Company, which has been in business since 1886. Once a small Arkansas stone company, Smiths has grown to be one of the worlds largest producers and suppliers of sharpening products. Their products can be found in nearly any hardware and sporting goods store. 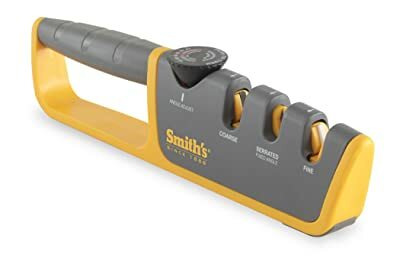 Smiths adjustable manual knife sharpener has two types of sharpening stages, the coarse and fine stage. Both of these stages can sharpen fine and serrated blades. Knives sharpen quickly and efficiently, and during the sharpening process, you have the option to adjust the angle of the sharpening from anywhere between 14 and 24 degrees. The sharpening components can be replaced when needed, and to make the process as comfortable as possible, the product has a nice soft grip handle and non-slip rubber feet. In addition, when sharpening the knife, you do not need to use pressure. The knives slip through very easily and without problems. Upon using the product, you’ll have knives that are as sharp as they were when they came out of the box. Finally, the product is extremely easy to store and can fit nearly anywhere in your kitchen. There are many benefits to this product. The main benefit is that it is extremely easy to use. With 6 adjustable angles, you can get nearly any level of sharpness that you are looking for. You also do not need to worry about the product being wobbly or slipping when you use it, as it is easy to grip and it sticks to the counter or any other surface when you sharpen your knife. It can sharpen a wide range of knives, so you are essentially buying a sharpener that you can put to good use in your kitchen. Lastly, the product comes with a three year warranty so you can protect your investment. The components are also replaceable so you can retain a quality sharpen as you slide your lives through. One of the main disadvantages of this product is that it does not sharpen very high quality blades well. For certain blades, certain types of sharpening stones are required. In addition, to sharpen your knife to perfection, it requires a more than one or two strokes. You need to really put effort when sharpening. Also, you need to be careful not to put too much pressure on the product when you sharpen your knife, as you can ruin both it and the knife itself. Therefore, for those who do not like to take care when using products, this may not be the best option. Essentially, if you are looking for a decently priced product that fits well in your kitchen and can sharpen nearly any ordinary kitchen knife to perfection, then this sharpener is the right choice.